Kitchen tools such as meat slicers or hamburger patty makers make life just a little easier. Meat Lugs and Meat Saws to prepare your meat and then use hog ring pliers to seal poly bags or fibrous casings for your finished product. This professional butcher saw allows you to easily cut meat into more manageable pieces. The heavy-duty, sturdy construction and stainless steel blade allow this butcher saw to slide effortlessly through any type of meat or bone. Trigger mechanism controls blade tension and allows for fast, easy rep.. Larger, extra deep, 50 lb capacity meat lug for easily toting foods while working on large projects. Great for handling & mixing meat when making sausages or burgers. Lug measures 7" high. 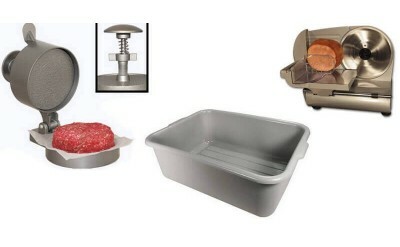 BPA FreeFeatures Measures 19" x 13.75" x 7" deepColor - Grey Smooth interior finish for easy cleaning Will ..
Freezer proof lid fits Heavy Duty Meat Lug. Stack-able and perfect for storing your meat in the refrigerator or freezer. Note - Lid does not seal air tight on heavy duty meat lug. Color: Grey 83-8003-W..